In a world where everything from a greeting card to an FM radio might bear the words “made from recycled materials,” it was only a matter of time before eco-conscious sunglasses would begin to flood the marketplace—shielding the pupils of environmentally conscious consumers. These glasses are almost always available for purchase with prescription and/or glare-reducing polarized lenses. The majority of eco-friendly shades are fashioned from bamboo. Taking only three to seven years to reach maturity while many other types of wood need decades, bamboo is the fastest growing plant on earth, regenerating eight times faster than hardwood. In addition to being moisture-resistant and having a tensile strength greater than steel, harvesting bamboo will not kill the plant. These qualities combine to make bamboo a great, certifiably “green” choice for eyewear. 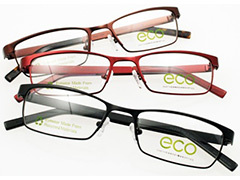 Another popular material for eco sunglasses is castor oil-derived plastics. According to Raconteur, castor plants are “non-GMO and can grow on poor soil in semi-arid areas using little water and very few pesticides.” Castor oil is a popular and especially chic choice for eco eyewear, with Gucci and Stella McCartney both offering lines of castor-based sunglasses. Perhaps the most inspiring detail about eco eyewear is that many retailers donate a portion of their proceeds to charity, with several of them, like Wear Panda and SOLO Eyewear, guaranteeing that every sale will fund eye care for someone in an impoverished nation who would not otherwise be able to afford it. Eco-conscious sunglasses provide a distinct eyewear choice to consumers looking to live an all-green lifestyle.